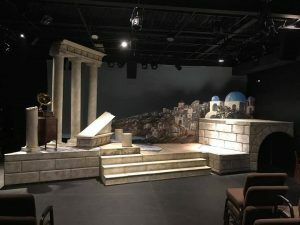 For most involved in a production, hell week begins the weekend or so prior to the show’s opening, when we begin putting all of the tech together with costumes, on a finished set, etc. 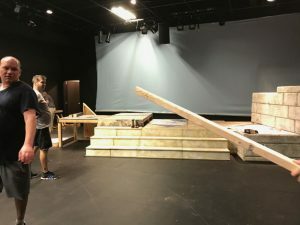 My “hell week” always begins with load-in and becomes a mad dash leading up to opening night. The past week was the usual scramble, finishing up the last of the set components to prepare for load-in. We had some warm weather early in the week and I took advantage of those couple of days to spend some daytime hours in the shop. After last weekend’s big building blitz (I love alliteration), I had the mine and platform facings to finish. Or iginally, the mine was to be a platform that was 5′-6″ off the floor, faced with a stone arch. But Scott decided after seeing the design that he did not foresee using a platform that high, so I was able to instead make the mine as a box out of 2×2 framing and covered with luan. This also allowed me to make it an irregular shape, canting the opposite direction from the rest of the platforms. This really set a nicely balanced dynamic to the overall composition. I began by making the top because the sides were just vertical panels and they needed to be made to fit the angles established in the top. In order to hide as many seams as possible, I decided that the top was a couple of stone slabs that were about 6″ thick. 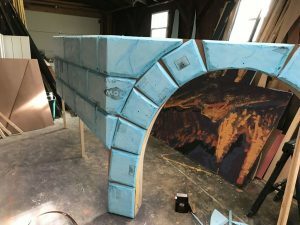 By fabricating the two pieces of the top with a downward turn of 6″ and facing that turn with foam board, I could round the edges and texture them like weathered stone. Then the sides were easy…just a couple of flat panels face is luan and foam board, cut and textured to look similar. 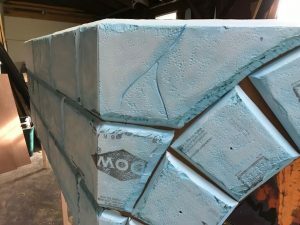 To create the stone texture, normally I would laminate a full sheet of foam on each panel and carve it with the hot knife. To get mortar joints I would begin with a V groove and then feather the edges with a flat blade. But I was trying to use materials that I had already and did not have a bunch of full sheets of foam to work with. I had a bunch of scraps. So, I cut blocks into “stones” using the table saw, beveling the edges by tilting the blade. When I glued them to the luan panels, the beveled edges did the same thing as using a V groove blade in the hot knife. From that point on, the process was the same. I feathered the edges, making them irregular and weathered. I then beat the surface of the foam with a wire brush, poking hundreds of little holes in the face of the foam board. Finally, I went over the whole surface with the heat gun. This smoothed out the feathered edges and opened up the holes that I had poked in the faces, creating a rough texture. I repeated this process by cutting flat panels of luan in the exact shapes that I needed to face the platforms wherever the stairs did not cover them. When all of this was done, they stylistically blended together, making a fairly convincing representation of the weathered limestone platforms that form the bases to most Greek ruins. 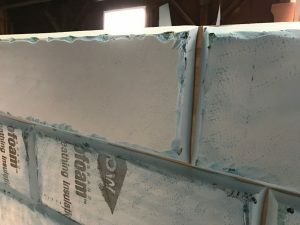 (See the photo at the beginning of the post) I then sprayed all of these textured pieces with the base coat of paint, saving hours of dabbing it into all of the little cracks and holes. Wednesday, Gary and Sharon finish painted the last of it and by Thursday, it was all stacked in the scenic shop waiting to be hauled to the theater. Saturday morning at 8:30AM Patrick and I loaded all of the pieces that we had built over the past 3 weeks into both Larry’s and my trailers. This was going to be a two-trailer load by the time I included the victrola and cabinet, 8 chairs and two tables. I still had a third table to make on Sunday. We got to the theater a few minutes before 10 and were met by the rest of our usual crew; Richard, Paul, Kate and Melanie. Fortunately, we did not have to move a bunch of chairs and seating risers for this show. They have not been moved since we set them up for “Tell Me on a Sunday” last July. We only had to slide a few stacks of chairs out of our way and we could begin with the set. That saved us more than an hour! 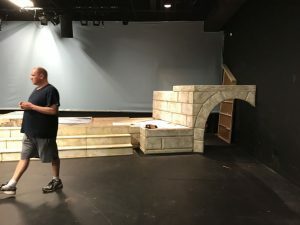 While Patrick and Richard began putting legs on platforms, Paul and I hung the blue muslin cyclorama against the theater back wall. As they finished up platforms, I laid out the mine top on the floor and marked where it went so that we could position platforms right up to it. Paul, Kate and I then began assembling the mine while Patrick and Richard set the rest of the platforms and stairs in place. Once the mine was assembled, they shot the platforms together and to the floor. Meanwhile, Melanie, Kate, and Paul installed the “hillside village” ground row on the back edge of the platforms beginning with the church piece which set on top of the mine. After finishing with the platforms, Richard and Patrick installed bracing behind the ground row to keep it standing without bouncing when we walked on the platforms. I then turned my attention to the column structure. 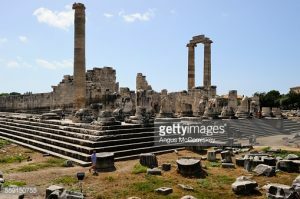 I began sensing that the columns would be too tall to stand on the 32″ high platform and leave room above to set the pediment. A ladder and tape measure later, my fears were confirmed. Turned out that this was the ONLY part of this whole set that didn’t fit together perfectly. It would seem that the lighting grid is 3″ down from the underside of the bar joists. I designed everything to just fit, but had never paid attention to that 3″. I have never gone that high with a set piece in the Marcelle. SO… we ended up taking the capitals off of the three columns and lopping 6″ off of each of them and reassembling the capitals. After that, it went together like designed. Last thing was to clean up and put away materials. All said and done, we were drinking a beer at Urban Chestnut by 2PM. It was a remarkably smooth install.